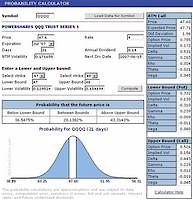 There are a wealth of analysis tools available including price and volatility history, option calculators, option chains, volatility skew charts, all free of charge. 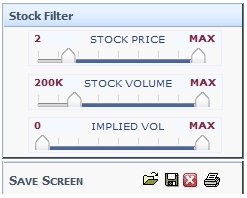 Numerous screeners for stocks and complex options are available. Screeners are updated daily. Delayed data is free, subscribers get more timely data. Our comprehensive tutorial covers the basics of options, the uses of options, options pricing, and complex option products. The tutorial is free. Read articles written by traders. Learn about the chances of profiting from a trade, trading cost, alternate strategies, volatility skew and more. Buy or Sell A Stock? Click on the images below to sample some of our popular resources. For a complete list, check out the Site Map. 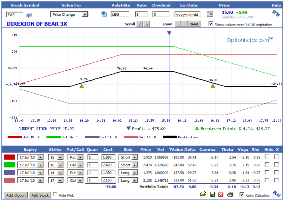 Registered users have access to the complete set of Optionistics tools. Registration is free. Subscribers get the latest data. Visit our subscription page for more information.